Cook, Tim. "The Canadian Great War Soldier". The Canadian Encyclopedia, 09 April 2018, Historica Canada. https://www.thecanadianencyclopedia.ca/en/article/the-canadian-great-war-soldier. Accessed 23 April 2019. Canada, as part of the British Empire, found itself at war on 4 August 1914. Yet Canadians would decide the extent of their commitment to the war. Members of the No. 2 Construction Battalion during the First World War. Photo circa 1916-1918, Amber Valley, Alberta. 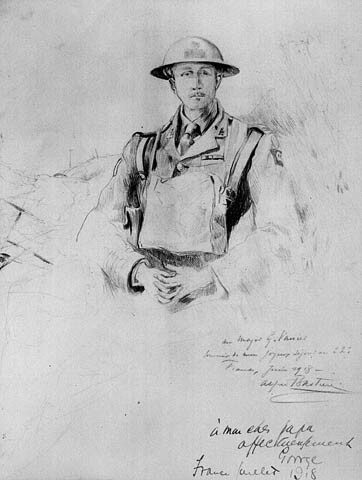 A pencil sketch of Major Georges Vanier, by Alfred Bastien. Vanier served with the 22nd Battalion (Van Doos) during the First World War. In 1959 he became governor-general of Canada. 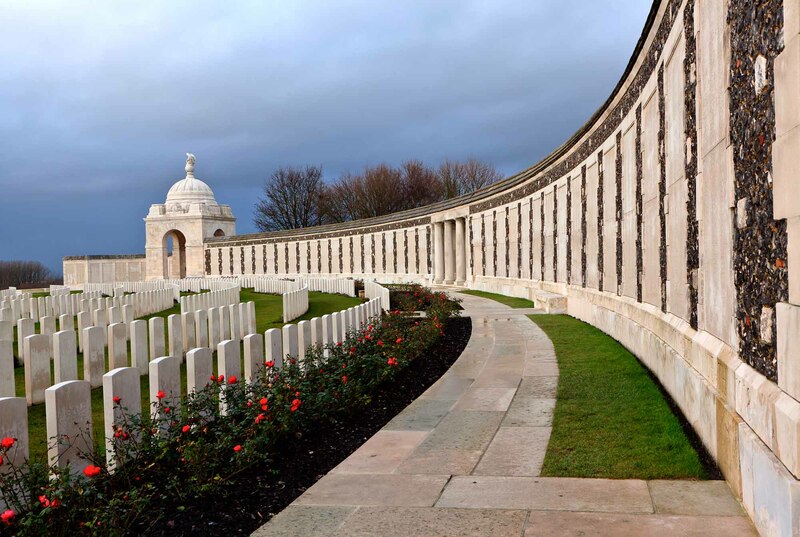 Namps-au-Val Cemetery in France, which includes the grave of Canadian First World War soldier and Victoria Cross recipient Gordon Flowerdew. Canada, as part of the British Empire, found itself at war on 4 August 1914. Yet Canadians would decide the extent of their commitment to the war. With no air force, a puny navy, and a professional army of a mere 3,100 men, the soon-to-be Canadian Expeditionary Force (CEF) would consist of citizen soldiers from across the Dominion. At the start of the war, there was a surge of patriotism and a desire to fight for King and Country. Men enlisted out of a sense of adventure, because of pressure from friends and authority figures, to escape an unrewarding job or an unhappy home life, and because it was widely thought the war would be over by Christmas. Within a few months, however, machine guns, artillery, and rapid-firing rifles left hundreds of thousands killed on the Western Front, and armies there were forced to dig in to the ground to escape the withering firepower. 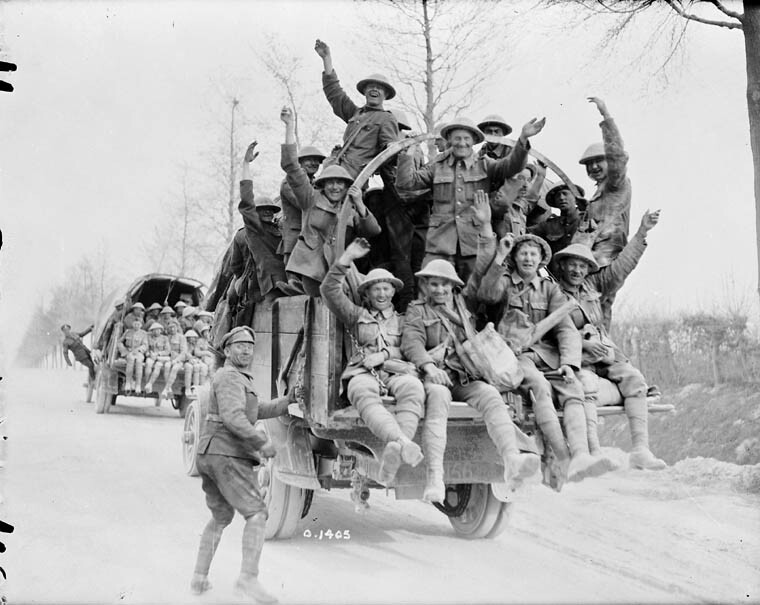 Yet even as the war appeared to have no end, Canadians continued to enlist by the tens of thousands until late 1916, indicating that many believed in the justness of the war – as a means of defending liberal ideas or supporting the British Empire. Others simply succumbed to pressure from recruiters or enlisted for any of the other countless reasons to serve in uniform and collect the steady pay of $1.10 a day for privates. After Minister of Militia Sam Hughes put out a call for recruits in August 1914, thousands of Canadians converged on Valcartier training camp near Québec City. The new Canadian fighting force could afford to be picky with so many men aching to serve, and the first force to go overseas, about 31,000 strong, consisted of a large number of ex-soldiers from the South African War and militia-trained men. About 70 per cent were British-born subjects, although some had lived in Canada for years, even decades. Their officers were largely Canadian-born. By the end of the war, the number of Canadian-born among the 630,000 Canadians who enlisted overall was about 51 per cent. The Canadian soldiers were initially to be at least 5 feet 3 inches tall and have a chest measuring 33 ½ inches. Gunners had to be larger, at a minimum of 5 feet 7 inches tall, to account for the heavy work of feeding the artillery pieces. These requirements steadily dropped throughout the war, as more men were needed for overseas service. Initially, there were stringent medical examinations of potential recruits. Men with childhood diseases, injuries, ill health, pulmonary diseases (especially tuberculosis), flat feet, and poor eyesight were denied service. Rotting teeth could lead to denial too, and many a frustrated man raged that he wanted to fight the Germans, not bite them. The patriotic and the desperate tried to cover up or lie about their ailments, and they were not above bribing medical officers or recruiting sergeants. Even then, tens of thousands were turned down from service. The age limit for recruits was to be between 18 (later 19) and 45, but overage soldiers and teenagers lied about their age. With 260 infantry battalions raised across the country, many of these new units competed against each other for recruits in the larger cities. Often, the units turned a blind eye to those who did not meet age requirements. With no national list of recruits who had been denied service, enterprising youth or greybeards could try to enlist time and time again or with different units. Most found a way into the service. An estimated 20,000 underage soldiers eventually enlisted and about 2,000 were killed overseas. During the course of the war, the average age of Canadian soldiers was 26 years old, although it was younger in the infantry battalions at the front. For the first year of the war, the wives of married men could demand that their husbands be released from service. (About 20 per cent of the CEF was married with children.) Soldiers who went overseas assigned some of their money to their wives, although soldiers’ dependants were also supported by federal monthly stipends. These funds, which would have been difficult for families to survive on, were topped off by the Canadian Patriotic Fund, which was re-established early in the war. Canadians from across the country donated tens of millions of dollars to the CPF, which administered the money to Canadian soldiers’ families. From an analysis of soldiers’ attestation forms and medical files after the war, some basic data has been compiled about the Canadian soldier. The average Canadian enlisted man had an education level of grade six, although that was of little surprise for an overall Canadian population that remained more rural than urban, and whose boys and girls were expected to earn their keep and help support the family. Education remained a luxury for most Canadians, although officers were better educated than the rank and file. The Canadian overseas soldier was drawn from all classes and regions although not, of course, with equal representation. Ontario and the West, with about 60 per cent of the country’s population, provided 73 per cent of the CEF, while Québec, with 27 per cent of the population, supplied only 14 per cent. (Most Québec recruits appeared to be English speaking.) These are broad statistics and, like all figures, they shift depending on how they are analyzed, but it is clear that Québec contributed far fewer soldiers per capita than did other provinces. That is not surprising, since it was an English-speaking army fighting at Britain’s side, and Québec’s influential local parish priests often warned against serving overseas in this foreign war. This English army was also very much formed from Canadian labourers, even though the Dominion was more rural than urban. One sampling of 263,111 men who had enlisted by 1 March 1916 revealed that 6.5 per cent were farmers, 18.5 per cent were white-collar clerical workers, and 64.8 per cent were labourers and workers, with the rest falling in various other categories. The Canadian Expeditionary Force was initially a white, Anglo-Saxon force, with few French Canadians and almost no visible minorities. First Peoples were not denied the right to serve, but there was much uncertainty about whether the Germans would show captured Aboriginal soldiers any mercy. Enlistment was usually left to the discretion of individual units and their officers. An estimated 4,000 Aboriginal people served. While many were typecast in the role of snipers and scouts — and some proved extraordinarily good in those positions, such as Henry Norwest and Francis Pegahmagabow — Aboriginal people served throughout the various units. Somewhat surprisingly, especially considering First Peoples’ lack of status in Canada, at least a handful were commissioned as officers during the war, usually serving in the British air forces. 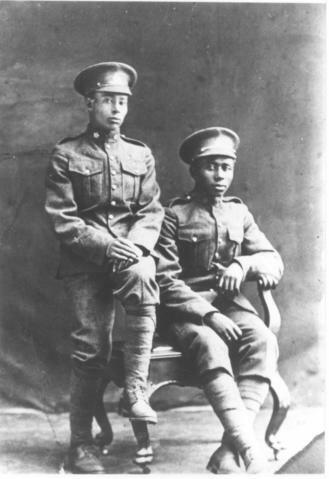 It was not until 1916, when recruitment slowed across the Dominion, that Japanese and Black Canadians, as well as other ethnic groups, were allowed to enlist. The most identifiable Black unit was No. 2 Construction Battalion, which consisted of 600 Black enlisted soldiers. Another 800 or so Black Canadians served throughout the armed forces. Drawing largely from the West Coast, more than 222 Japanese Canadians fought against racist prejudices and questions of disloyalty to enlist in the CEF. Eleven were awarded medals for gallantry, and 54 were killed in battle. As many as 4,000 Ukrainians served in the CEF, which is perhaps a higher figure than expected since Ukrainian Canadians were viewed by many Canadians as disloyal. About 5,000 Ukrainians (with another 3,000 German-born Canadians) were also interned during the course of the war. Yet even as Ukrainians were interned, thousands enlisted to serve King and Country. A veteran of the Russian Imperial Army, Filip Konowal was one such Ukrainian. He had emigrated to Canada in 1913 and enlisted in the CEF two years later. As a corporal in the 47th Battalion, he was awarded the Victoria Cross at the August 1917 Battle of Hill 70, where he led several attacks against German machine-gun positions and, at one point, single-handedly attacked seven Germans, killing them all. In addition to Ukrainians, thousands of Polish, Russian, and Romanian soldiers served. All of these numbers are imprecise because record keeping was not aimed at identifying specific race or ethnicity. The United States remained neutral in the war until April 1917, and so thousands of Americans came north to enlist. It is estimated that close to 40,000 Americans joined the CEF (10 per cent of the Force),and many of them were Canadians or British-born who lived in the United States. Enlistment by Americans dropped off steeply after the US entered the war. By late 1916, the number of recruits had dried up to a trickle. The casualties on the Western Front were relentless, however, and units there needed constant reinforcement. At home, war industry and farming were desperate for workers and salaries jumped considerably. 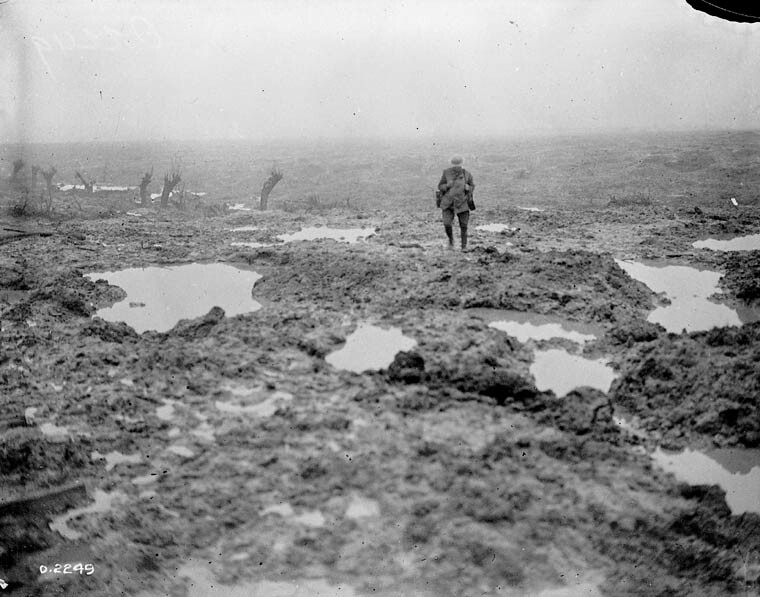 News of the conditions at the front, with the horror of the trenches, rats, unburied corpses, and murderous shellfire, dissuaded many men from enlisting. Anger and disunity rose across the country as some Canadians felt the burden of the war was not being shared evenly. In May 1917, Sir Robert Borden’s government felt compelled to announce conscription through the Military Service Act, a move that Borden framed as supporting the soldiers overseas who had already sacrificed so much for the nation. The federal election of December 1917 was one of the most divisive in Canadian history, pitting region against region, farmers against those in the cities, ethnic and language groups against one another, and even community and family against one another. The election saw much of Canada turn on Québec, which was accused of not doing its fair share in supporting the war, especially in contributing soldiers for overseas service. These tensions were to create deep scars during and after the war. Borden’s Unionist government (a coalition of Conservatives and Liberals) won the election and conscription was enacted. Aimed initially at 20 to 24 year old males, and later applied to those aged 20 to 35, it forced them into uniform against their will, although there was a process by which men could apply for exemptions. Tribunals across the country judged the merits of each man’s case — some were harsh, while others let men avoid service with a wink and a nudge. By the end of the war, the Militia Department reported that 99,651 young men were conscripted, and of those24,132 served at the front. Conscription left a dark legacy, but the conscripts played an essential role in bringing ravaged fighting forces up to strength in the final battles of 1918. Canadian soldiers in uniform looked like their British counterparts save for minor differences and a few Maple Leaf and Canada symbols. They also served in the British Expeditionary Force and were, for much of the war, commanded by British generals. But the Canadians had a reputation as something different than British soldiers. Like the Australians, the Canadians were drawn from the Empire’s outer reaches and viewed as rugged northern warriors, if ill-disciplined. Much of this was simple mythmaking or imagination forged through years of novels and fanciful travel literature to feed widespread notions in Britain that the Canadians were all Voyageurs and Mounted Police. Canadians were not born with a gun in their hands; they were not innate hunters and trackers, and the majority of the CEF was drawn from urban centres where the recruiting was fiercest and where pre-war militias were most prevalent. The Canadians did, however, earn their fierce battlefield reputation on the Western Front. 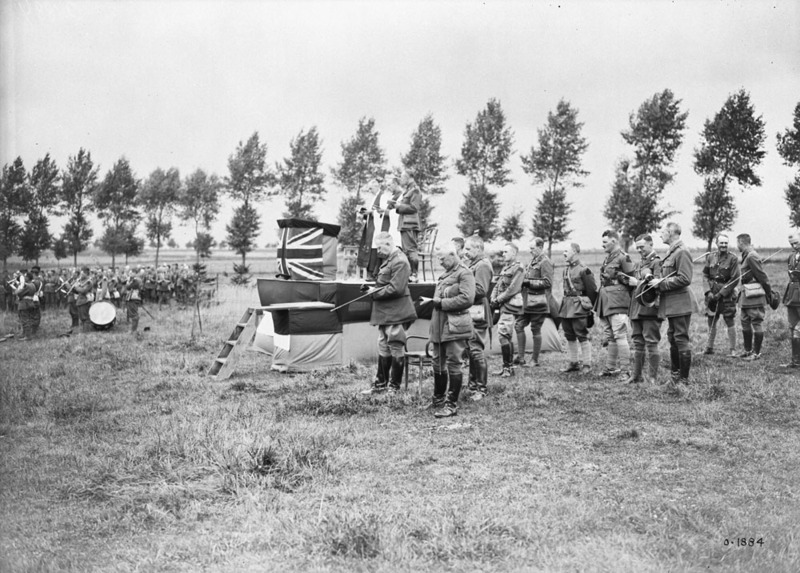 From the first Canadian engagement at the Battle of Second Ypres, in April 1915, where the Dominion’s soldiers made an heroic, if costly, stand; to the victory at Vimy Ridge, in April 1917; to the series of battles that formed the Hundred Days campaign in the final months of 1918; the Canadians were viewed by their allies and enemies as shock troops to be thrown into the fiercest battles to deliver victory. By war’s end, 619,636 men and women (nurses) had enlisted in Canada during the war. 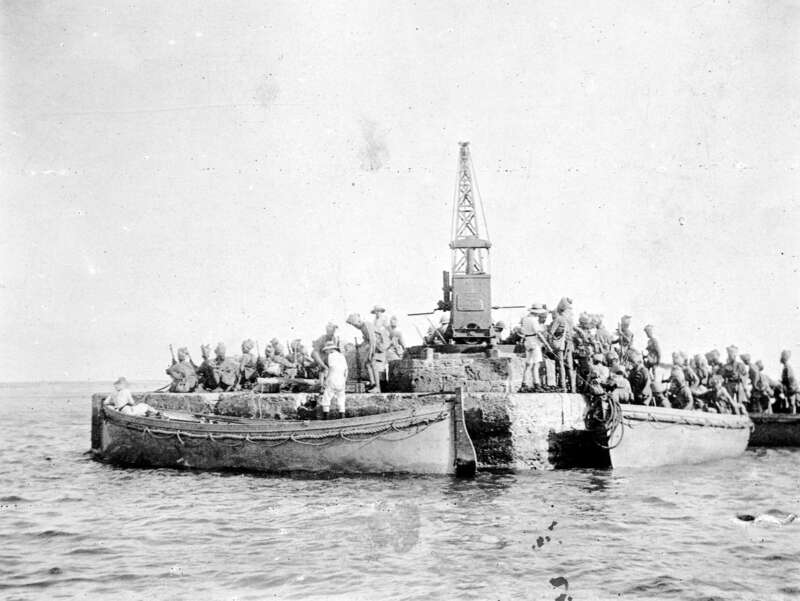 Another 8,826 Canadians sailed with the Royal Navy and the Royal Canadian Navy. Several thousands more enlisted directly in England with the Canadian Expeditionary Force. Yet, of the roughly 630,000 Canadians who served overall in the CEF, only 425,000 went overseas. They paid a high price for their service, with the total number of dead and wounded numbering 234,741, and with several thousand more dying of their wounds in the war’s immediate aftermath. Desmond Morton, When Your Number’s Up: The Canadian Soldier in the First World War (1993). Tim Cook, At the Sharp End: Canadians Fighting the Great War, 1914-1916 (2007). Tim Cook, Shock Troops: Canadians Fighting the Great War, 1917-1918 (2008). Peter Broznitsky, "For King, not Tsar: Identifying Ukrainians in the Canadian Expeditionary Force, 1914–1918," Canadian Military History 17.3 (2008). James Dempsey, “Norwest, Henry,” Dictionary of Canadian Biography, vol. 14 (2013).